Stainless steel baking molds are extremely durable with a smooth hard non-porous surfaces that are easy to clean and provide great baking results. Our Stainless steel molds distribute temperature evenly in both the oven and the chill fridge or freezer. Black, Steel Non-stick Bavarois Mold, 7.13"
3.88" X 7.13" X 3.5"
This Paderno World Cuisine 7.125 inch non-stick bavarois mold is designed to make the creamy cold dessert called Bavarois. Its shape is ideal for the Bavarois' gelatinous texture and egg-custard base. It is often lined with ladyfingers. Features:Professional qualityHeavy-dutyWoodenGears allow for easy spinningMaterial: Steel. Black, Steel Non-stick Brioche Mold, 2.33"
3.88" X 2.33" X 1"
This Paderno World Cuisine 2.325 inch non-stick 10-flute brioche mold's fluted and flared sides beautifully shape and color the brioche. The top surface of the mold is approximately double that of the base which provides an excellent crust-to-crumb ratio. Black, Steel Non-stick Brioche Mold, 3.1"
3.88" X 3.13" X 1.25"
This Paderno World Cuisine 3.125 inch non-stick 10-flute brioche mold's fluted and flared sides beautifully shape and color the brioche. The top surface of the mold is approximately double that of the base which provides an excellent crust-to-crumb ratio. Black, Steel Non-stick Brioche Mold, 4"
3.88" X 4" X 1.5"
This Paderno World Cuisine 4 inch non-stick 10-flute brioche mold's fluted and flared sides beautifully shape and color the brioche. The top surface of the mold is approximately double that of the base which provides an excellent crust-to-crumb ratio. Black, Steel Non-stick Brioche Mold, 4.32"
3.88" X 4.33" X 1.63"
This Paderno World Cuisine 4.325 inch non-stick 10-flute brioche mold's fluted and flared sides beautifully shape and color the brioche. The top surface of the mold is approximately double that of the base which provides an excellent crust-to-crumb ratio. Black, Steel Non-stick Flower Baking Mold, 7.88"
7.88" X 7.88" X 2.38"
Black, Steel Non-stick Fluted Boat Mold, 3.12"
This 3 1/8 long by 1/2 high plain non-stick boat mold is ideal for pastries, cakes as well as petit fours, mini-quiches and hors d'oeuvres. 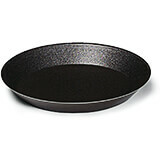 It is made of non-stick coated steel.Features:Professional qualityCreates a professional looking pastryMaterial: Steel. 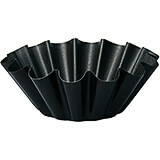 Black, Steel Non-stick Fluted Boat Mold, 4"
This 4 long by 1/2 high plain non-stick boat mold is ideal for pastries, cakes as well as petit fours, mini-quiches and hors d'oeuvres. It is made of non-stick coated steel. 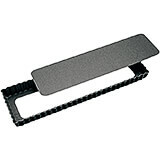 Features:Professional qualityCreates a professional looking pastryMaterial: Steel. Black, Steel Non-stick Fluted Boat Mold, 4.75"
This 4 3/4 long by 1/2 high plain non-stick boat mold is ideal for pastries, cakes as well as petit fours, mini-quiches and hors d'oeuvres. It is made of non-stick coated steel. 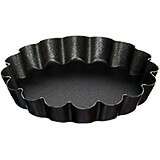 Black, Steel Non-stick Fluted Tart Pan for Tartlets, 2"
This 2 diameter non stick fluted tartlet mold is ideal for petit fours, mini-quiches, tartlets, and hors d'oeuvres. Black, Steel Non-stick Fluted Tart Pan for Tartlets, 2.38"
This 2 3/8 diameter non stick fluted tartlet mold is ideal for petit fours, mini-quiches, tartlets, and hors d'oeuvres. 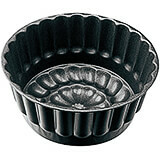 Black, Steel Non-stick Fluted Tart Pan for Tartlets, 2.75"
This 2 3/4 diameter non stick fluted tartlet mold is ideal for petit fours, mini-quiches, tartlets, and hors d'oeuvres. 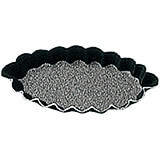 Black, Steel Non-stick Fluted Tart Pan for Tartlets, 3.12"
This 3 1/8 diameter non stick fluted tartlet mold is ideal for petit fours, mini-quiches, tartlets, and hors d'oeuvres. Black, Steel Non-stick Fluted Tart Pan for Tartlets, 4"
This 4 diameter non stick fluted tartlet mold is ideal for petit fours, mini-quiches, tartlets, and hors d'oeuvres. Black, Steel Non-stick Fluted Tart Pan for Tartlets, 4.75"
This 4 3/4 diameter non stick fluted tartlet mold is ideal for petit fours, mini-quiches, tartlets, and hors d'oeuvres. Black, Steel Non-stick Kugelhopf Mold, 8.62"
8.62" X 8.62" X 4.75"
This 8 5/8 diameter by 4 3/4 high non-stick fluted Kugelhopf ring mold is designed to proof and bake the Trois Freres yeast cake, named after the 19th-century Julien brothers who invented the glazing of pastries with liquored apricot marmalade. The central tube in the Kugelhopf mold doubles the contact of the dough with the metal, ensuring uniform and accelerated cooking. Black, Steel Non-stick Plain Boat Mold, 2.38"
This 2 3/8 long by 3/8 high plain non-stick boat mold is ideal for pastries, cakes as well as petit fours, mini-quiches and hors d'oeuvres. It is made of non-stick coated steel. 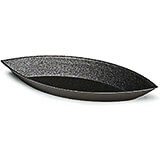 Black, Steel Non-stick Plain Boat Mold, 3.12"
This 3 1/8 long by 1/2 high plain non-stick boat mold is ideal for pastries, cakes as well as petit fours, mini-quiches and hors d'oeuvres. It is made of non-stick coated steel. Black, Steel Non-stick Plain Boat Mold, 4"
13.75" X 4.33" X 1.13"
This Paderno World Cuisine 13.75 by 4.325 inch rectangular non-stick fluted tart mold comes with a removable bottom for easy unmolding. The fluted sides increase the surface area, which in turn creates a strong crust capable of holding and containing the heavy ingredients of a quiche or a fruit tart. Black, Steel Non-stick Savarin Mold, 10.25"
10.25" X 10.25" X 2.5"
This 10 1/4 diameter by 2 1/2 high non-stick Savarin mold is designed to proof and bake the Trois Freres yeast cake, named after the 19th-century Julien brothers who invented the glazing of pastries with liquored apricot marmalade. The central tube in the Savarin mold doubles the contact of the dough with the metal, ensuring uniform and accelerated cooking. 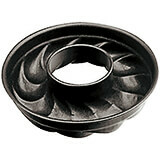 Black, Steel Non-stick Savarin Mold, 2.5"
This 2 1/2 diameter by 1/2 high non-stick silicone Savarin mold bakes the yeast-raised sweet Savarin cake and can also be used with aspic, baba and vegetables. Its central tube doubles the contact of the dough with the metal, ensuring uniform and rapid cooking. 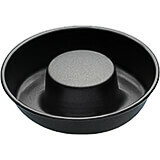 Black, Steel Non-stick Savarin Mold, 3.12"
3.12" X 3.12" X 0.75"
This 3 1/8 diameter by 3/4 high non-stick silicone Savarin mold bakes the yeast-raised sweet Savarin cake and can also be used with aspic, baba and vegetables. Its central tube doubles the contact of the dough with the metal, ensuring uniform and rapid cooking. 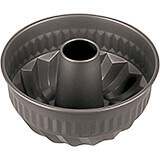 This 3 1/8 inches non-stick savarin mold is designed to bake the yeast-raised sweet Savarin cake. However, the open mold can also be used for aspic, baba or vegetables. It's central tube doubles the contact of the dough with the metal, ensuring uniform and rapid cooking. 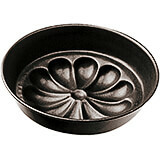 Black, Steel Non-stick Savarin Mold, 4.75"
This 4 3/4 diameter by 1 high non-stick Savarin mold is designed to proof and bake the Trois Freres yeast cake, named after the 19th-century Julien brothers who invented the glazing of pastries with liquored apricot marmalade. The central tube in the Savarin mold doubles the contact of the dough with the metal, ensuring uniform and accelerated cooking. Black, Steel Non-stick Savarin Mold, 8.62"
8.62" X 8.62" X 1.75"
This 8 5/8 diameter by 1 3/4 high non-stick Savarin mold is designed to proof and bake the Trois Freres yeast cake, named after the 19th-century Julien brothers who invented the glazing of pastries with liquored apricot marmalade. The central tube in the Savarin mold doubles the contact of the dough with the metal, ensuring uniform and accelerated cooking. 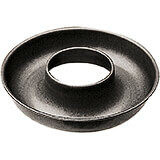 Black, Steel Non-stick Savarin Mold, 9.5"
This 9 1/2 diameter by 2 high non-stick Savarin mold is designed to proof and bake the Trois Freres yeast cake, named after the 19th-century Julien brothers who invented the glazing of pastries with liquored apricot marmalade. The central tube in the Savarin mold doubles the contact of the dough with the metal, ensuring uniform and accelerated cooking. Black, Steel Non-stick Square Baking Mold, Removable Bottom, 9"
This Paderno World Cuisine 9 by 9 inch square non-stick fluted tart mold comes with a removable bottom for easy unmolding. The fluted sides increase the surface area, which in turn creates a strong crust capable of holding and containing the heavy ingredients of a quiche or a fruit tart. Features:one-piece constructiontwo handlesno gears to breakno areas for flour and food to accumulateMaterial: Steel. 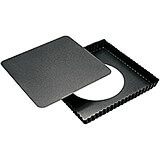 Black, Steel Non-stick Tart Pan for Tartlets, 2"
This 2 diameter non stick plain tartlet mold is ideal for petit fours, mini-quiches, tartlets, and hors d'oeuvres. 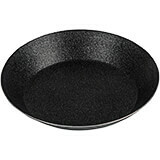 Black, Steel Non-stick Tart Pan for Tartlets, 2.38"
This 2 3/8 diameter non stick plain tartlet mold is ideal for petit fours, mini-quiches, tartlets, and hors d'oeuvres. 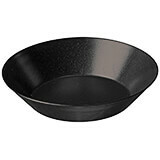 Black, Steel Non-stick Tart Pan for Tartlets, 2.75"
This 2 3/4 diameter non stick plain tartlet mold is ideal for petit fours, mini-quiches, tartlets, and hors d'oeuvres. Black, Steel Non-stick Tart Pan for Tartlets, 3.12"
This 3 1/8 diameter non stick plain tartlet mold is ideal for petit fours, mini-quiches, tartlets, and hors d'oeuvres. Black, Steel Non-stick Tart Pan for Tartlets, 4"
This 4 inches non-stick plain tartlet mold is ideal for petit fours, mini-quiches, tartlets, and hors d'oeuvres. It is made of tin plate or steel with non-stick coating. Black, Steel Non-stick Trois Freres Mold, 8.62"
8.62" X 8.62" X 2.12"
This 8 5/8 diameter by 2 1/8 high non-stick Savarin mold is designed to proof and bake the Trois Freres yeast cake, named after the 19th-century Julien brothers who invented the glazing of pastries with liquored apricot marmalade. The central tube in the Savarin mold doubles the contact of the dough with the metal, ensuring uniform and accelerated cooking. 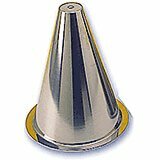 Stainless Steel Cannoli Forms, Conical, 5.5"
5.5" X 1.13" X 1.13"
This Paderno World Cuisine 1.125 inch diameter stainless steel cannoli form is used to make the traditional Italian dessert called Cannoli. Dough is wrapped and fried around the open-ended stainless steel form. This is a sure way to get a perfect looking dessert. 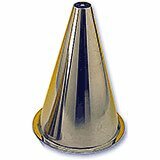 Stainless Steel Cannoli Forms, Conical, 6.75"
6.75" X 1" X 1"
This Paderno World Cuisine 1 inch diameter stainless steel cannoli form is used to make the traditional Italian dessert called Cannoli. Dough is wrapped and fried around the open-ended stainless steel form. This is a sure way to get a perfect looking dessert. 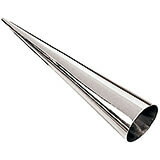 Stainless Steel Cannoli Tubes, 3.63"
3.63" X 0.59" X 0.59"
This Paderno World Cuisine .593 inch diameter stainless steel cannoli form is used to make the traditional Italian dessert called Cannoli. Dough is wrapped and fried around the open-ended stainless steel form. This is a sure way to get a perfect looking dessert. 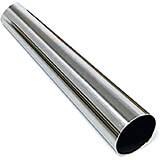 Stainless Steel Cannoli Tubes, 5.5"
5.5" X 0.88" X 0.88"
This Paderno World Cuisine .875 inch diameter stainless steel cannoli form is used to make the traditional Italian dessert called Cannoli. Dough is wrapped and fried around the open-ended stainless steel form. This is a sure way to get a perfect looking dessert. 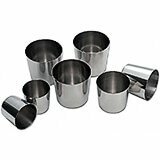 Stainless Steel Cone Mold For Croquembouche / Cream Puff Tower, 10"
Stainless Steel Cone Mold For Croquembouche / Cream Puff Tower, 11.87"
Stainless Steel Cone Mold For Croquembouche / Cream Puff Tower, 13.75"
Stainless Steel Cone Mold For Croquembouche / Cream Puff Tower, 9.25"
Stainless Steel Cream Horn Mold, 4.38" X 1.38"
4.38" X 1.38" X 1.38"
Stainless Steel Cream Horn Mold, 6.38" X 1.88"
6.38" X 1.88" X 1.88"
Stainless Steel Cake Mold, perfect to make Rum Baba or Dariole dessert. Perfect for baking fish mousses and flans. Pack of 6. Measurements: 1 3/4" Diam. 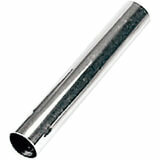 x 1 3/4" H. Capacity: 2 oz. Weight: 9 oz. 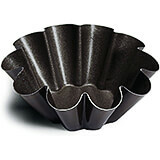 Stainless Steel Cake Mold, perfect to make Rum Baba or Dariole dessert. Perfect for baking fish mousses and flans. Pack of 6. Measurements: 2 3/16" Diam. x 2 3/16" H. Capacity: 4 oz. Weight: 12 oz. 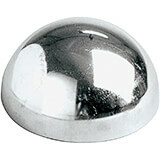 Stainless Steel Cake Mold, perfect to make Rum Baba or Dariole dessert. Perfect for baking fish mousses and flans. Pack of 6. Measurements: 2 1/2" Diam. x 2 1/2" H. Capacity: 6 oz. Weight: 1lb. 1 oz. 2.38" X 2.38" X 0.75"